“I think that man is drawing me…” Normally this would be the start of a dateline story about a stalker drawing his “muse,” only to result in a chase that involves a log cabin and the police. This is not the case with “Icon,” an original musical by Luke Yerpe, performed by Hinman Production Company. A picture is worth a thousand words and for Daniel, an artist who creates a drawing of his perfect woman, it is worth a lot more. When Daniel draws his “icon” woman, his fantasies come alive and the line blurs between fantasy and reality. Lights up on Daniel, played by Jordan Gagnon, a sophomore majoring in mechanical engineering. Daniel sings about the inspiration for his drawing, Polly, the beautiful girl sitting across the coffee shop. 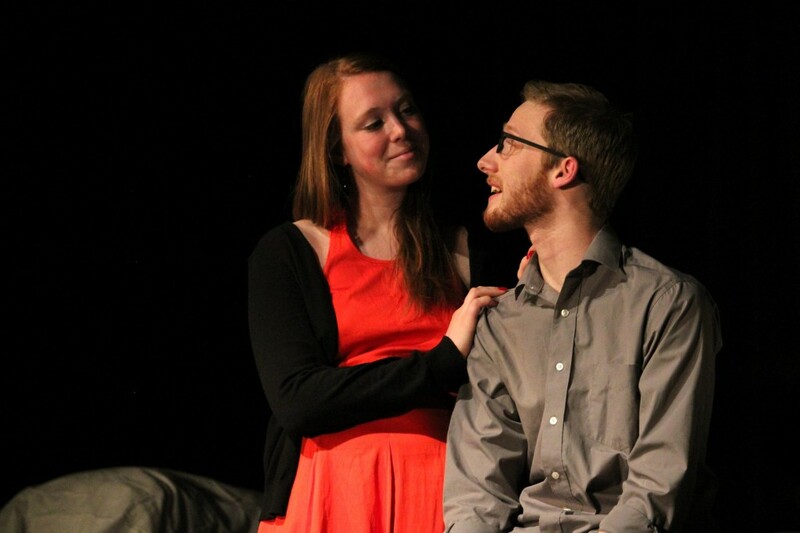 The lights go out and the spotlights shine down on Daniel and Polly, played by Jessica Wallace, a freshman double-majoring in psychology and human development. And thus, their romantic relationship begins as Polly, flattered by her admirer, introduces herself. The initial interaction between Wallace and Gagnon is adorable, hilarious and spot-on as they try and ease the awkward tension between the two of them. Luckily, the rest of the cast comes in singing “Commission,” a comical song about, well, commission, nodding to “Fiddler on the Roof’s” “Tradition.” Here, they also introduce the magazine, cleverly titled, “Illustrators Illustrated,” that Daniel will illustrate. After fiddling around with the set on their first run-through, the cast comes back alive, and so does Daniel’s Polly-inspired artwork. Enter Esther, with her fiery red hair and a red dress to match. There is something very compelling about Esther, something beneath the surface that the magazine’s readers find fascinating. So does Daniel as he becomes infatuated with his creation. “You’ve given me so much … the pose, the walk, the looks, and now the voice,” says Esther, played by Erin Stolz a freshman majoring in geography. As Esther comes to life, it complicates Daniel’s relationship with Polly and his perception of reality. This idea echoes the likes of “Weird Science” or more recently, “Ruby Sparks,” as it is a very relatable scenario. In “Icon,” Stolz serenades Gagnon with her sultry voice and says the line that sums it all up, “I’m the voice that only you can give me,” as he falls into her arms. This is where director Luke Yerpe comes in. Yerpe, a graduate student in mathematics, is the man behind the magic and the voice behind “Icon.” “Icon” is Yerpe’s original musical and, with the help of assistant director Leah Nassau, a freshman majoring in theater, and musical director Denise Aquino, a graduate student studying mathematics and music, Yerpe is able to deliver his vision. “Icon” is not just a great original musical, it also applies to everyday life. In addition to the three main characters, Yerpe also emphasizes the intricate personalities of the supporting characters. At the center of the play, however, is the tension between Daniel, Polly and Esther that results in juicy conflict for the audience to watch unravel. Gagnon shines as Daniel, playing him with such humor and an endearing quality that is both charismatic and irresistible. “Icon” is just that. Come find your real fantasy with the HPC in their production of “Icon” on Thursday, Friday and Saturday at 8 p.m., with an additional 2 p.m. matinee performance on Saturday in the Hinman Commons. Tickets are $5 at the door.